We just released WPJobBoard 5.2 and you should soon see this update in your wp-admin panel. If you will not see it within 24 hours go to wp-admin / Dashboard / Updates panel and click “Check Again” button it should show then. In the version 5.2 we introduced 3 main updates and improvements. Editing job alerts from candidate panel. For a few years now we have back-filling integration with Indeed and CareerBuilder. Unfortunately, Indeed made their API almost inaccessible to small site owners and CareerBuilder made their API partially private and users need to be approved to get an API key. For this reason, we are introducing ZipRecruiter integration, it will allow any job board owner to backfill his job board with jobs from ZipRecruiter. This is not a feature you can on your site, but the new updates server is an important part of the whole WPJobBoard ecosystem. 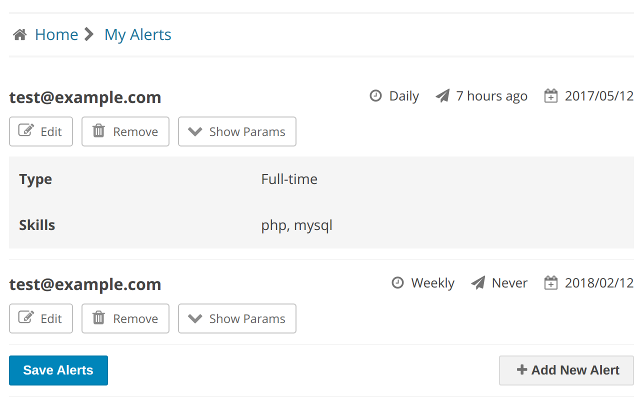 It will allow us to server automatic updates not only for the WPJobBoard but for the extensions as well. The two extensions which will allow you to take advantage of this functionality are Application Methods and Google Analytics Integration. Both add-ons will become available by the end of this month. Since the next release, the updates server will be also used by our Job Board Theme – Jobeleon, (we wanted to have it available in this release but wasn’t able to do that due to differences between plugin and theme updates). When a registered company posts a job without adding a logo to the job posting, the job will display without a logo. In WPJB 5.2 if a user has a logo uploaded to his Company Profile he does not need to upload a logo again to his job postings, WPJB will automatically use the logo from Company Profile. Ability to display just the [wpjb_jobs_list] search bar, without the results. Some users just want to have a page with a search bar and show the results on a different page. This is possible now by using [wpjb_jobs_list] with “show_results” and “redirect_to” parameters. FIXED: Redirect failing after password change. FIXED: Redirect failing after logging out from Candidate or Employer panel. FIXED: Redirect failing after deleting Employer or Candidate account. FIXED: Resume privacy settings not respected in the candidate registration form. Click here to download list of f the les changed in WPJB 5.2 and Jobeleon 1.6.1. More great updates, thank you for the continued evolution of the product. The ZipRecruiter integration looks particularly interesting. With regards to the Default Job Logo – what would be really nice here, is for non-registered company jobs, i.e. typically those pulled from a back-filling api such as Indeed, to either not show any logo rather than the WPJobBoard generic job image, OR, the ability to apply a default job category logo, such as a small png. For example any of my aviation jobs, where a company logo is not present, I could simply have a small airplane logo against it’s listing in the job board view. "Jobs Available" on YOUR website! See our software solution, a jobs board plugin for Wordpress. Works with ANY Wordpress theme. Now hosting a job board is easy AND affordable!